Declassified U.S. Documents Show Richard Nixon and Brazilian President Emilio Médici Discussed Coordinated Intervention in Chile, Cuba, and other Latin American nations "to prevent new Allendes and Castros"
Brazilian General Accused U.S. of Asking Brazil to "do its dirty work"
"Memos Show Nixon’s Bid to Enlist Brazil in a Coup"
"Brazil played role in U.S.-backed overthrow of Chile's Allende, document shows"
During the same meeting, President Médici asked Nixon if “we” should be supporting Cuban exiles who “had forces and could overthrow Castro’s regime.” Nixon responded that “we should, as long as we did not push them into doing something that we could not support, and as long as our hand did not appear.” The two also participated in a discussion of the potential to undermine the populist Peruvian President General Velasco Alvarado by publicizing the allegation that he had a lovechild with a mistress—she was a former “Miss Peru”—in Paris, according to General Vernon Walters who also attended the Médici/Nixon meeting. The documents were declassified in July as part of the State Department’s Foreign Relations of the United States (FRUS) series. The memcon records Nixon telling Médici that he “hoped we could cooperate closely, as there were many things that Brazil as a South American country could do that the U.S. could not.” Indeed, the documentation reveals that Nixon believed that a special relationship with Brazil was so important that he proposed a secret back-channel between the two presidents “as a means of communicating directly outside of normal diplomatic channels.” Médici named his private advisor and foreign minister Gibson Barbosa as his backchannel representative, but told Nixon that for “extremely private and delicate matters” Brazil would use Col. Manso Netto. Nixon named Kissinger as his representative for the special back channel. Communications between Nixon and Medici using the special back-channel remain secret. Peter Kornbluh, who directs the National Security Archive’s Chile and Brazil projects, noted that "a hidden chapter of collaborative intervention to overthrow the government of Chile" was now emmerging from the declassified documentation. "Brazil's archives are the missing link," he said, calling on President Ignacio Lula da Silva to open Brazil’s military archives on the past. “The full history of intervention in South America in the 1970s cannot be told without access to Brazilian documents." 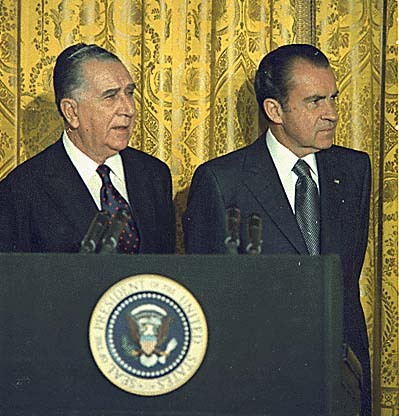 Drawing on Brazilian sources, a CIA intelligence memorandum noted that Médici had proposed that Brazil and the U.S. cooperate in countering the “trend of Marxist/leftist expansion” in Latin America and that Nixon promised to “assist Brazil when and wherever possible.” The report noted that the substance of the secret talks had created concern among some officers in Brazil who believed that responsibility for these operations would fall to the Brazilian Armed forces. The memo quoted General Vicente Dale Coutinho as stating that “the United States obviously wants Brazil to ‘do the dirty work’” in South America. In 2002, National Security Archive analyst Carlos Osorio posted a declassified Top Secret memorandum of conversation of Nixon’s meeting with British Prime Minister Edward Heath dated December 20, 1971, during which the two discussed Brazil’s role in South America. “Our position is supported by Brazil, which is after all the key to the future,” states Nixon, “The Brazilians helped rig the Uruguayan election... There are forces at work which we are not discouraging." Document 1: White House Memorandum, Top Secret, “Meeting with President Emílio Garratazú Médici of Brazil on Thursday, December 9, 1971, at 10:00 a.m., in the President’s Office, the White House”, December 9, 1971. Document 2: Memorandum from the Senior Department of Defense Attache in France (Gen. Walters) to the President’s Assistant for National Security Affairs (Henry Kissinger), undated. In a memo to National Security Advisory Henry Kissinger, General Vernon Walters reports on the meeting between Médici and Nixon, and on the follow-up instructions that Nixon has given. First, Nixon wants Kissinger and Secretary Connolly to ensure priority support for the Inter-American Development Bank. Nixon also wants Kissinger to know that Nixon’s special channel to Médici and the Brazilians will be through Foreign Minister Gibson Barbosa, that Col. Arthur S. Moura who presently was the Army and Defense Attache in Brazil should be promoted to Brigadier General. The President also expects Médici to tell Kissinger of the visit of Argentine president Lanusse to Brazil and then Kissinger will relay the information to Nixon. Gen. Walters is also instructed to convey to Kissinger how much Nixon enjoyed meeting Médici and establishing a close relationship with the Brazilian president. Document 3: CIA Memorandum, from CIA Deputy Director Robert Cushman to National Security Advisor Henry Kissinger, “Alleged Commitments Made by President Richard Nixon to Brazilian President Emílio Garrastazú Médici”, December 29, 1971. After word of the discussion between Nixon and Médici leaks to the Brazilian military, the CIA transmits intelligence on the reaction among several officers. A memo from CIA Deputy Director Robert Cushman to National Security Advisor Henry Kissinger, asserts that the talks between Brazilian President Medici and President Nixon resulted in the two countries forming a pact to combat Latin American communism. Cushman also reports that General Vicente Dale Coutinho, commander of the fourth army, and other field grade officers in the Northeast, “have learned from a “Cabinet leak” that secret talks between the two Presidents were of great importance in the formulation of Brazilian foreign policy.” According to CIA intelligence, the military officers believe that the focus of the talks centered on hemisphere security, and Nixon reportedly asked support from Medici “in safeguarding the internal security and status quo in the hemisphere, including the governments of Bolivia and Uruguay.” Medici agreed to the request and “personally believes the Brazilian government must assume a greater role in defending neighboring, friendly governments.” According to the report, General Coutinho takes offense to this notion and feels that the U.S. wants Brazil “to do the dirty work” and he believes the Brazilian military will be significantly disadvantaged because of it. Document 4: National Intelligence Estimate 93-73, Secret, “The New Course in Brazil”, January 13, 1972.